An advanced manufacturing hub focused on delivering the Industry 4.0 agenda to defence and other industries has opened in South Australia. The Tonsley Manufacturing Innovation (TMI) Hub, located at the former site of Mitsubishi’s automotive manufacturing in Australia, is being led by Flinders University, the South Australian government and the Innovative Manufacturing Cooperative Research Centre (IMCRC). 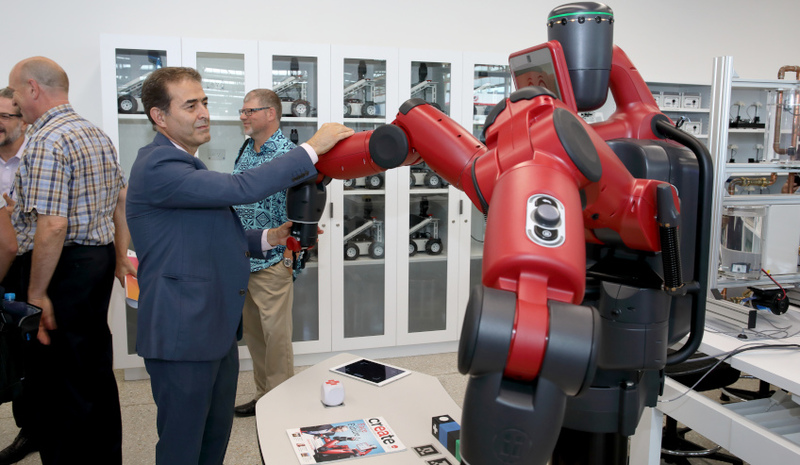 The hub showcases the latest automation, sensor, monitoring, robotic and cobotic technologies with a focus on offering opportunities for world-class education and training in advanced manufacturing within a research environment. Practical training and real-world research opportunities will be available for students, researchers and businesses wanting to learn more about automation, advanced robotics and the internet of things. Companies within the precinct, including defence industry alumni SAGE Automation and Siemens, will work with the hub and offer training reach into South Australia's growing defence industry and advanced manufacturer sector. The director of the Australian Industrial Transformational Institute, Professor John Spoehr, said the TMI will play a catalytic role in promoting the understanding and application of the Industry 4.0 (i4.0) agenda, including robotics and automation in highly networked and flexible cloud-based production systems, as well as the naval shipbuilding industry. "With $90 billion worth of investment going into naval shipbuilding over the next 50 years and there being a commitment to introduce Industry 4.0 standards essentially to the operation of this new naval shipbuilding capability in South Australia and nationally, shipbuilding becomes really a technical university for the introduction of Industry 4.0 for Australia," Professor Spoehr told Defence Connect. "It’s a prime example of how traditional manufacturing is making way for advanced manufacturing in the new economy. TMI will play a key role in accelerating the growth of advanced manufacturing by skilling our future workforce, with the adoption of digital technologies in South Australia giving rise to a new generation of manufacturers and highly skilled jobs. "It will also help organisations to build their i4.0 capabilities through accredited and non-accredited education and training programs. Companies that engage with the TMI will greatly improve their chances of successful participation in defence supply chains to tap into the $90 billion worth of shipbuilding projects taking place in South Australia." Flinders University's new Innovative Manufacturing Accelerator Program, which will support manufacturing-based companies to fast-forward product development and commercialisation processes is designed to go hand in hand with the TMI Hub. IMCRC CEO and Managing Director, David Chuter, said that the opportunity to catalyse investment in South Australian manufacturing is exciting. "The IMCRC embraced the opportunity to work strategically with the South Australian Government and Flinders University, investing collaboratively to identify projects with the potential to ignite innovation and catalyse manufacturing growth," he said. "The South Australian Government should be applauded for its foresight to invest in the Future Factory as part of their financial contribution to IMCRC, making the innovation process tangible and accessible for manufacturers. This can now facilitate effective collaboration between the research community and industry through the utilisation of these technologically advanced facilities." One of the leading companies with a presence at the TMI Hub and investing in Industry 4.0 is SAGE Automation. Adrian Fahey, SAGE Group chief executive, said digital technology and industry 4.0 is very much front of mind and advancing at an incredible rate. "The Tonsley Manufacturing Innovation Hub is a great opportunity to build even stronger links between education and industry," Fahey said. "Being a part of this Hub gives is an opportunity to continue to focus on what we’re doing in industry 4.0, but also to tap into some of the new thinking from the institutes and the University and collaborate to deliver the very best thinking for our clients." SAGE Automation is currently in a joint venture with SEA 5000 bidder Navantia and has previously worked across various defence projects including the Air Warfare Destroyer project. The launch of the hub, which offers industry and researchers technologies to design, visualise and test production processes in a virtual environment to greatly mitigate risk prior to physical production, was attended by over 300 people, with representatives from major defence primes including ASC, BAE Systems Australia, Boeing, Fincantieri Lockheed Martin, Naval Group, Navantia, Rheinmetall and Saab Australia. The centrepiece of new TMI Hub is the modular Future Factory made in Germany by technology giant Festo. It showcases the latest automation, sensor, monitoring, robotic and cobotic technologies and provides the opportunity for world-class education and training in advanced manufacturing within a research environment. This includes the Bionic Handling Assistant – a cobotic gripper arm modelled on the structure and function of an elephant’s trunk.